Last fall I visited numerous watersheds in the Great Bear Rainforest where an unnatural silence filled the air due to the lack of returning salmon. In many systems not a single bear, wolf or even eagle was to be seen. 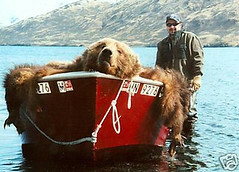 When I did finally see grizzly bears, what I witnessed was deeply disturbing. At a time when they should be gorging themselves on salmon for winter fat, these grizzlies had resorted to furiously digging in the estuary for plant roots. Grizzlies-especially coastal grizzlies-face a suite of threats to their survival. Destruction of their habitat and overexploitation of the salmon on which their very lives depend may be complicated, multifaceted issues to address. But one threat is not: trophy hunting. Photos, video and hunt sales on eBay are time sensitive. These photos were downloaded April 30, 2009. That the government of British Columbia continues to permit grizzly bears to be shot and killed for sport in our parks and protected areas is not only anachronistic from a wildlife management perspective, it is ethically deplorable as well. While hunters, governments, and conservationists continue to argue about the population status of grizzlies, the inescapable truth is that killing these magnificent animals for sport, trophy, and profit has no place in today’s society. It’s hard to believe, but these “recreational hunting opportunities” are now bought and sold on the world’s largest on-line auction site, eBay. 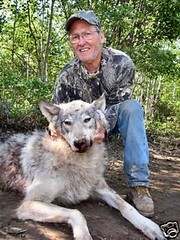 In February 2009, Raincoast and our US partner Big Wildlife, approached eBay to request they end sales of carnivore sport hunting on their website, citing that such sales glorify and promote profound animal suffering for fun and profit. Due to eBay’s hesitation, we met with them personally in California to present additional evidence of the ecological, evolutionary, economic and ethical arguments to stop trophy hunting. Further talks ensued. eBay had until April 30 to decide. 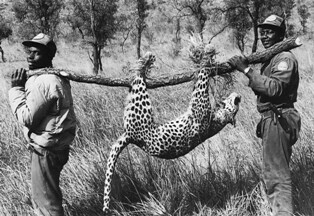 Note that eBay also sells African leopard and lion hunts. To see a full listing of hunts that eBay offers go to: Home/Buy/Sporting Goods/Outdoor Sports/ Hunting /Hunting Trips & Leases. On May 1, eBay announced they would continue their sale of trophy hunting, arguing that the activities “comply with applicable laws” and they only discontinue sales of items the public finds offensive. Clearly, eBay needs to hear from you as to whether gunning down grizzlies as they fish for salmon, treeing cougars with dogs, and blasting away wolves for fun is offensive. We urge you to contact eBay and add your voice to this debate. The campaign to stop eBay’s auctioning of trophy hunts is just one of our efforts to protect grizzlies and other coastal carnivores. In 2005, Raincoast purchased a guide outfitting territory, forever putting the conservation of grizzlies as the top priority in a 24,000 sq km region. We are currently in discussions to add additional territories and, with the necessary funding, dramatically expand our protection and monitoring efforts. Action empowers. Action matters. Use the link in the side bar to donate today. And please consider joining our Monthly Giving program for sustained support of our work. You can help us in the fight to ban trophy hunting of grizzlies, black bears, wolves and other large carnivores in the Great Bear Rainforest. We need your financial support to continue our leadership role in protecting wildlife in this region. Your dollars translate into a voice at the table where key decisions in the debates that matter to you are taking place. Thank you for your support! We’ll keep you updated on the eBay campaign and our other initiatives. Sample Message to eBay: I have recently learned that eBay sells trophy hunting of North American bears, wolves, and cougars as well as African cats. I believe this is ethically indefensible and that these activities further violence toward animals for ego gratification and profit. 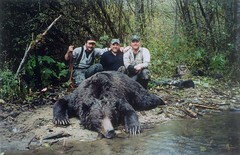 Further, trophy hunting adds to the many threats these species already face. I am asking you to end the sales of these activities.